Whether you’re an elite athlete or a weekend warrior, hydration is key during exercise. Here are some of our top tips to help guide you on how much you need to drink, and what to drink, before, during and after exercise. Why is hydration important during exercise? Around 60% of your body is water and it plays a vital role in every bodily function. You can lose a lot of fluid when you exercise – as much as a litre or two an hour – mainly through sweating and breathing. If you don’t top this fluid back up, you can get dehydrated. This can affect both your general health and how well you can exercise. You’ll feel tired more quickly if you’re dehydrated, and you won’t be able to control your temperature as well as usual. It may not cross your mind, but making sure you’re well hydrated before you exercise is really important, especially in hot conditions. This will affect your performance and can even lead to heat stroke. Drinking enough will help you get the most out of your exercise session and feel good while you’re doing it. 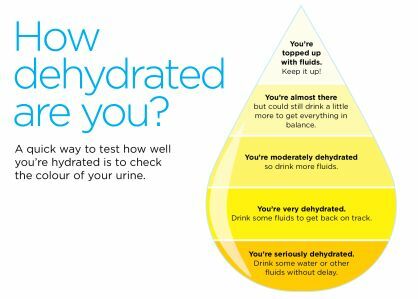 One quick way to test if you’re hydrated is to check the colour of your urine. It can take time for fluids to be absorbed into your body. So drink steadily during the day and aim to drink around 500ml of fluid at least four hours before you exercise. In the 10 to 15 minutes before you exercise, top up your fluid levels by drinking about half this amount again. It’s important to drink water during a workout – take a water bottle with you on a run, for example. Being dehydrated can affect your energy levels. Your muscle cells are almost three-quarters water so if you're short on fluid, you’ll feel the strain. Drinking little and often rather than a lot less often will give you the best chance of hitting your exercise targets. The best way to figure out how much to drink is to respond to what your body tells you. If you feel thirsty, you really need to drink as your body is already showing signs that it needs to take on more fluid. Here’s another way to work out how much fluid you lose while exercising and how much to drink to compensate for it. Weigh yourself before exercise (ideally do this first thing in the morning after you go to the toilet). Once all the hard work is over, no doubt you’ll be ready for something to drink. Not only will this be refreshing, but it will also restore your fluid levels and help your muscles to recover. The sooner you start to replace the fluid, the sooner you’ll recover. Don’t be tempted to reward yourself after exercise with a pint or a glass of wine. Alcohol is a diuretic, which means it removes water from your body by increasing how much urine your kidneys produce. The array of sports drinks on the market can be overwhelming and they can contain lots of added sugar. So it’s hard to know which to choose and if they really offer any benefit. If you’re doing moderate amounts of exercise, you won’t need them. Simple water is often the best thing to drink during and after a workout. But if you’re doing strenuous training, sports drinks may be useful. If you’re exercising for longer than an hour, sports drinks or even just squash can help you keep going for longer. As well as replacing lost fluid, they contain carbohydrates (sugar) and electrolytes like sodium, potassium and magnesium, which you lose though sweat. These drinks provide fuel and help to keep you hydrated. To avoid spending lots of money on sports drinks which may contain lots of sugar and additives, try making your own at home. Mix 200ml squash (not a low-sugar variety) with 800ml water and add a large pinch of salt. If you’re training for an endurance event like a marathon or triathlon, speak to a dietitian for advice that’s personalised for you. For more information, take a look at our guide on nutrition for sports and exercise. In a worst-case scenario, severe hyponatraemia can lead to a coma, seizures (fits) and even death. If you have any of the symptoms above while you’re drinking while exercising, seek urgent medical advice. Get to know what your sweat rate is (see our Hydration during exercise section above) and track how much you’re drinking. If you’re using a refillable bottle, make a mental note of how many times you top it up.